A few years ago, I read Girl of the Limberlost, by Gene Stratton Porter, for the first time. It's actually the sequel to Freckles, which I haven't read yet. GOL was one of my grandmother's favorite books. It was published in 1909, which probably explains the name of the main character: Elnora. Gene Stratton Porter was born in Indiana, and was an author, naturalist, and nature photographer. According to Wikipedia, she was also one of the first women to form a movie studio and production company. How cool is that? The Limberlost Swamp, the setting for the book, is a real place. 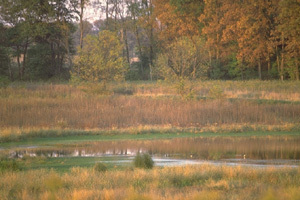 Here's a picture from the state of Indiana website - over 428 acres preserved for nature study! I read this book when I lived in North Carolina and was homesick for Michigan, which made the story's setting of Indiana near and dear to my Midwestern heart. I loved reading about all the different kinds of moths Elnora collected. It's been a lot of years, and it was well before I began commonplacing, so I don't have any favorite quotes to share with you. I remember it being a story about a strong young woman who persevered through a great deal of hardship and poverty, and made a success of herself, finding love in the process. I remember feeling a special connection with the story, knowing my grandmother loved it. If you've read any of Gene Stratton-Porter's books, what was your favorite? I've followed your G+. Thanks for the book recommendation. I picked up a copy. Sweet! I'm not familiar with that author but I love the name Elnora. Might use that sometime. Nice to meet you on A to Z.
I've never read the book though I do have a video of a movie made based on the book. I haven't watched that movie in 20 years so I don't remember what it was like.